Had it not been for image, power and charisma, Indian cricket’s state of affairs would be contracting even more than it has over this English summer. By not turning up for the ICC awards ceremony in London, deliberate or not, the force of the critics’ arguments have carried on in to the abyss. The indications, thus far, are that Team India is unwilling to acknowledge mistakes on its part. The focus on their absence might have temporarily found some of the underperformers’ relief from being a part of obscure passages in tabloids, but the road away from London towards Wales will finally put an end to what has been nothing short of a disastrous series for India. The Indians will certainly be hoping that crossing the English border would hopefully see a turn in their fortunes as batting stalwart Rahul Dravid, under strange circumstances, gets ready to wear the Indian blue outfit for the last time in his limited-overs career. That Graeme Swann had to openly admit that seeing Dravid for the last time would make the bowlers around the world heave a sigh of relief is a testament to his wonderful, illustrious career. Dravid has been the most perfect iteration of the textbook approach candidate. At various instances, during an era ruled by the hard hitters and shorter formats, a serene eye would squint as it witnessed Dravid attempt an odd slog, so unnatural of him, in the middle: open-chested, sweat-laded shirt, high elbowed, and ramrod straight – he could have so easily been the strict disciplinarian amidst pampered souls, lost in a world ruled by chaos. The next-gen fan seems to have a primal need for watching the ball travel high and afar; cricket has become the modern day equivalent of The Epic of Gilgamesh. It is common wisdom among great cricketers that there are preconditions for attaining success at the very highest level – they key factor being mastering the basics. It is a trait that even fetched two of England’s top three batsmen, batting-order wise, highest honours during the ICC Awards ceremony in London a few days ago. The icing on the cake for both Cook and Trott would be to send the visitors back home without a win all summer. History-making is rarely free, and the Englishmen are on a roll with the momentum backing them as they approach Cardiff. Broad’s injury would definitely deprive them of their star performer this summer, but the manner in which the replacements have slotted in and performed would give Andy Flower little headache. India’s addiction to picking youngsters on tours outside the subcontinent and not giving them a run is very much like American addiction to Oil. Why Varun Aaron hasn’t been given a look in yet is a question that beats most of us. If they thought he was ready before he boarded the flight to London, one can’t seem to concretize on a reason why he wouldn’t be ready now. Even if Cardiff were to script a remitting horror story so reflective of this summer, it wouldn’t be a bad idea to witness what this youngster has in store. Plenty of words have been written, both supportive and critical of the visiting team on and off the field. A victory in Cardiff wouldn’t alter the writing on the wall to an extent that the scars will heal effortlessly. But certainly, a win over the current World Number One would offer some credibility to a unit that has appeared as dry as dates with a loyal fan base slowly swallowing the bitter seed that they never would have imagined to have germinated after a memorable world cup win earlier this year. As the curtains are about to close on a series that has been haplessly one-sided, a war hero from the victimized camp will slowly, and humbly, walk away from the arena in which he has amassed over 10000 runs at an average close to 40. As he bows out, so will an integral part of the art of classical batsmanship, from the shorter format of the game! It is hard to decide whether to laugh or frown after witnessing the scenes at The Lord’s on Sunday. While the result was clearly unexpected, the belligerence within was revealing through the body language of players from both camps, during different instances. Dhoni’s frustration is understandable – the battle has gone bonkers with every route to success having brick walls with loaded artillery. Once again, the D/L method proved as hard to comprehend as The Grand Unified Theory, and as ruthless as terrorists as both camps underwent nervy moments when the rain gods intervened towards the end. A neutral, whole heartedly would state that a tie was a fair result. Not before both camps showed their reluctance to enter the field when the numbers were inclined to their side. Quantitatively, India got off to a good start by weathering the new ball in order to prevent a repeat of what happened at The Oval. Qualitatively though, Rahane’s rather slow start to his innings witnessed moments of lunatic madness as he tried to whack the leather out of the white ball as frustration seeped in. Rahane would have completed an entire team’s innings had he been playing baseball instead of cricket. Parthiv, at the other end, dismissed anything that was short of length by quickly shifting his weight on to the back foot and pulling the ball with confidence. Both the openers had luck on their side and trudged along at close to five-an-over. While the numbers seemed convincing, the approach, especially from Rahane, wasn’t. He’d have done well to learn from this innings on how to approach the game when shots keep finding the fielders. Another miniature collapse, following the dismissal of Dravid and Kohli almost immediately after one and other, saw the Indian skipper work on rebuilding the innings once again. With Raina, heart in sleeve, hoping to become a part of the reconstruction, a solid partnership was built to suitably daunt the English attack. The run rate during the last ten overs headed towards the stratosphere, as over a hundred runs were gathered in a passage of play that helped India reach a more-than-respectable total of 280. It seemed as though the world had absorbed a lesson on Indian resolve, a characteristic that had made them world champions a few months ago. The English reply was an unpredictable scatter of method and madness. Only Ian Bell’s fifty stood out amongst the top four batsmen, after the openers had departed in search of quick runs. Ravi Bopara, one of the heroes from The Oval, played an innings of undoubted steadfastness by building valuable partnerships with Bell, Bresnan and Swann. Signs of sloppiness on the field from the Indians were vivid once again with RP Singh being the culprit for a chance that he left begging at long on. Another instance of a frustrated Jadeja’s overthrow, way off radar, would surely have brought a smile on to the face of Steve Harmison, who definitely needed chaffing after publicly expressing his disgust over Durham CC when they had released his brother Ben. At 173-5, bearing in mind Broad’s injury, the game seemed India’s to lose, with less than fifteen overs remaining. However, Bopara played intelligent cricket – strokes that demonstrated the work put in by a man who is clearly trying to cement a place in the current English setup. He targeted gaps, and slow fielders, to convert ones into twos and keep the rate ticking. The consequences of the Indian bowlers’ inability to walk through the lower order batsmen may become more apparent once the series is over, but England, no doubt, have enjoyed their role in the melodrama of lower order batting. Ravi Bopara played a crucial innings for the second time in two games this series. When rain intervened, the story had two parts to it: one, when the Indians were on the driving seat, and another, after another over, when the Englishmen took charge. 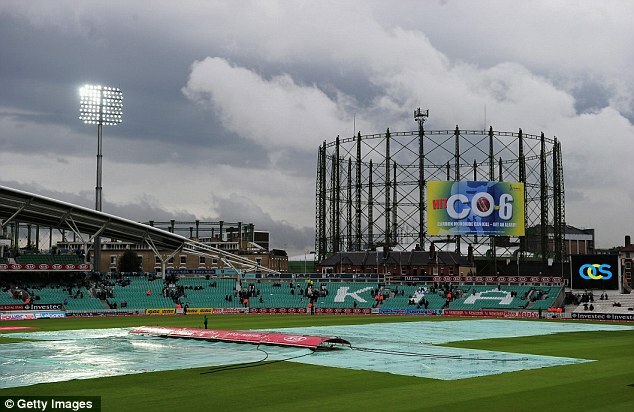 With the score at 242, when the second spell of heavier rain hit the city, it seemed as though that England had clinched the game with the demanded D/L score at that juncture reading 240. Earlier, the Indians had a brief advantage but the spell of rain vanished by the time the teams could leave the ground. But play resumed, much to the delight of the sport, to witness a spell of wickets falling in quick succession. Bopara departed by holing out to deep mid-wicket for a well constructed 96, but rain played spoil-sport again and used the D/L tenets do declare that the game was tied with England, at that time, further requiring 11 runs from 7 balls with a couple of wickets in hand. D/L doesn’t take into account the case of injured players who can’t bat. Just like how an organization’s balance sheet doesn’t capture the true costs and risks of business activities, The Lord’s scorecard did likewise. The verdict would simply pose that England clinched the series with India yet to record a victory this summer. As the focus shifts to Cardiff, there is still no ballast to raise any hopes within the Indian camp.